Callaway Golf’s latest irons are set to blaze a trail through courses around the world as the Warbird gets its long-awaited introduction. 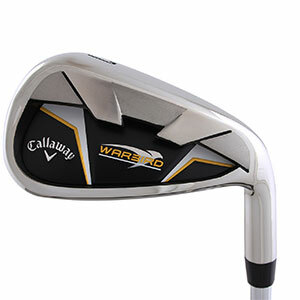 Packing amazing distance, performance and forgiveness, the Callaway Golf Warbird iron set has been designed to offer excellent distance while remaining forgiving through some of the oversized attributes of their head design. Warbird irons have a performance-driven design which features perimeter weighting to give golfers a higher launch and more distance, plus more stopping power around the greens. For extra forgiveness the irons have a large oversize club head, which creates a larger sweet spot area on the club face, for increased confidence to mid-high handicapper golfers. The Callaway Golf Warbird Irons Steel 5-SW are a sure-fire way to achieve better scores on the greens, and are available today from American Golf.